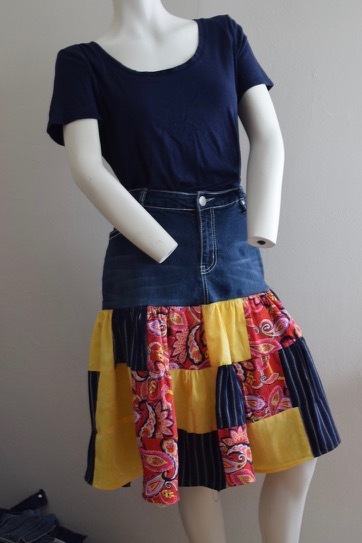 This simple skirt is made completely from scraps of thrifted cotton and an pair of old denim jeans. 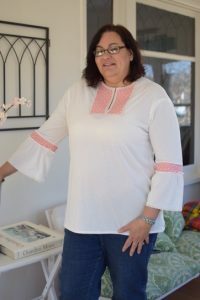 Here’s how you can save your scraps from the trash bin and create something fun and new to wear! Hi! 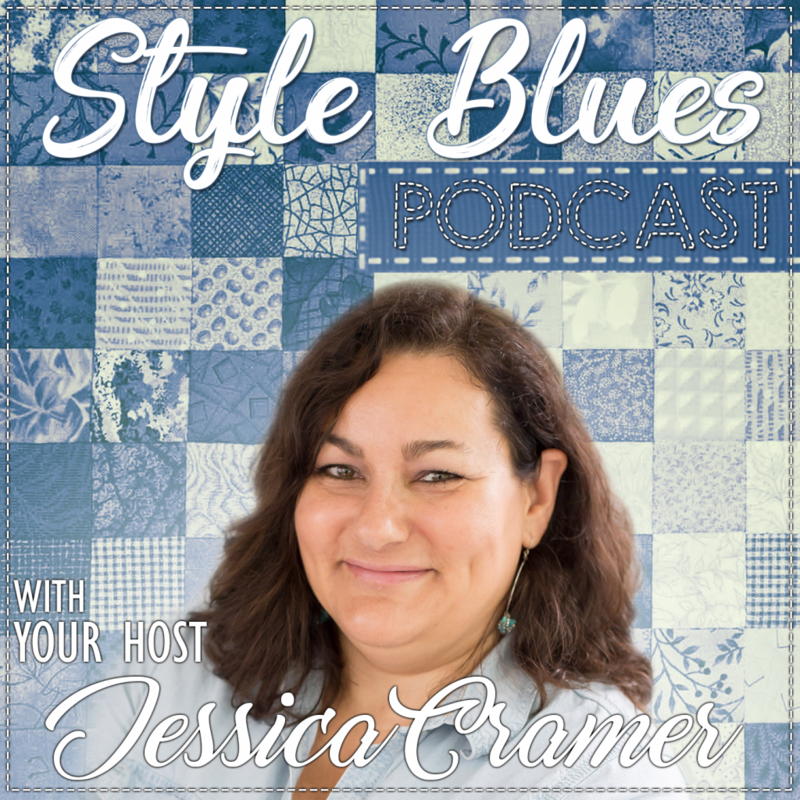 I’m Jessica and I blog at Designers Sweet Spot.com. 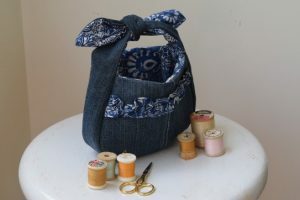 I also stitch up all sorts of fun things on my sewing blog Chambray Blues.com. I am so pleased to share this project with you all! 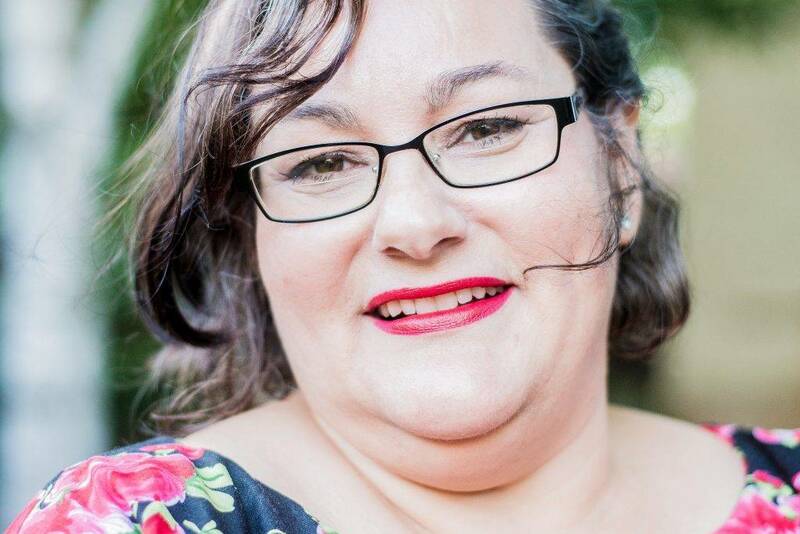 Thanks to Deborah for having me guest post on her amazing blog! I used to give away all my clothes that didn’t fit to the thrift store. That is, until I discovered that thrift stores only keep and sell 20% of the donations they receive, the rest are bundled and sold off to foreign countries or disposed of. Isn’t that sad? All that good stuff goes to waste! 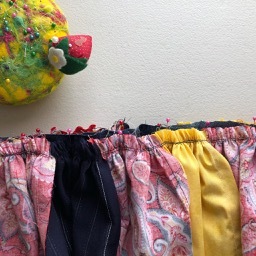 I now look for ways to reuse every bit of household fabric that I can especially if it is colorful and in good condition. This is especially true for denim items, Every old pair of jeans can find a new life in someway, this type of fabric iss so versatile and wears for such a long time. 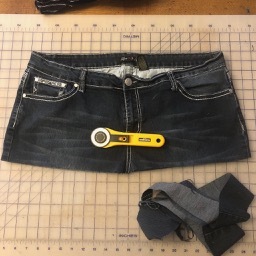 There have been dozens of popular recycled jean skirt projects across the web, this one is an easy version and quick to make with a few basic sewing tools. 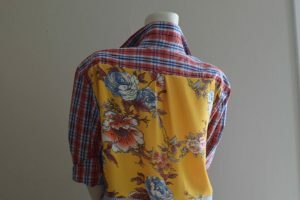 My fabrics came from the thrift store (other than the jeans that I already owned), which is an added bonus. The local thrift store here sells their fabric scraps for $.50 a bundle. You can’t possibly get any cheaper and I often find great quality fabric there that I couldn’t afford to buy new if it was in a fabric store. Pair this skirt with your favorite t-shirt and sandals for a quick shopping trip, date to the movies or walk on the beach. 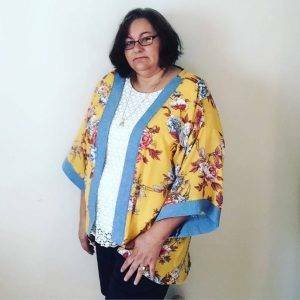 You can adjust the length by adding or subtracting rows of ruffles, it would also be an adorable maxi skirt with more rows of fabric. This adult (size 20) version falls just above the knee and finishes 23.5″ long. 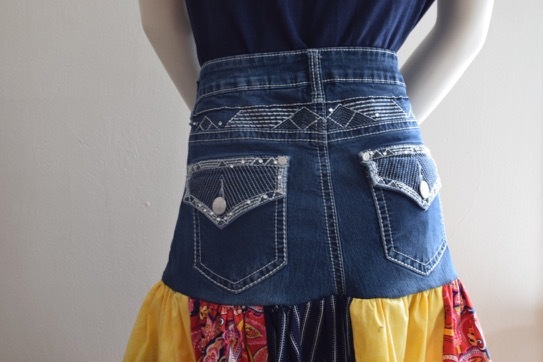 This would also work great for young girls who have out grown their jeans from last year! Fold jeans in half, matching side seams and crotch seams. Pin seams together, folding pockets out of the way so they won’t get cut in the next step. Measure 10 1/2″ down from top of waistband at side seam. Mark and cut across horizontally to the center front, remove the legs of the jeans and lower part of crotch as in photo. Set aside. Save pant legs for other projects. 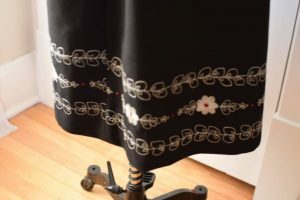 Lay cotton fabrics on cutting mat with fold near the zero cutting edge of the cutting mat (closest to you), and selvedges at the top of the mat (away from you). 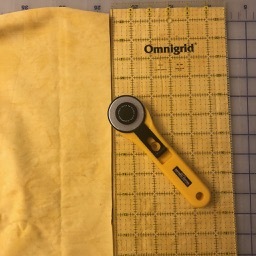 Using the quilting ruler, cut fabric into rows of 6″ wide strips. Turn cotton fabrics on the mat horizontally and cut again, into 11″ wide pieces. Cut pieces will measure 6″ x 11″. 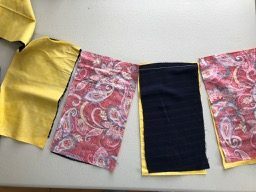 Cut 15 of each of the three printed fabrics for a total of 45 pieces. Stitch the short side of the cotton pieces together in rows of 15, using a 2.5 mm single needle stitch altering colors/prints at random. There is no need to cut the threads between each row, you can chain stitch them together for faster sewing. Continue as needed until all 15 pieces are stitched together. 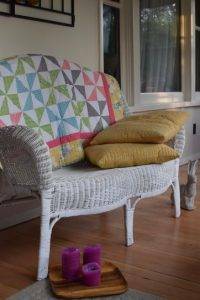 Gather top edges of each ruffle 1/2″ from top edge with a ruffling foot or by hand using two rows of 5.0mm basting stitch 1/8″ apart and pulling up the threads to gather. Sew ends of each row together to make three complete circles of ruffles. Continue with second and third rows of ruffles in similar fashion, checking the length and fit as you stitch each row on. Hem finished skirt with 1/4″ narrow rolled hem on bottom edge.